Denis Forkas Kostromitin is a Russian artist, currently living in Moscow, who has studied in China under traditional teachers. 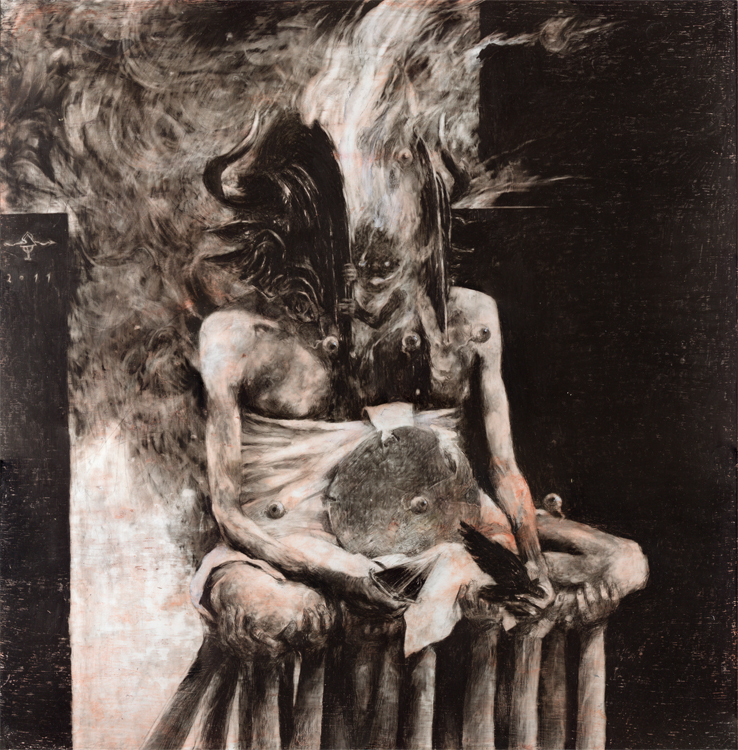 His paintings are dark, textural and hold a wealth of symbolism. “Durand suggested breaking with the European Logos-centric tradition and going beyond the object-subject system. According to his hypothesis, our world (‘our’ being the subject and ‘world’ the external objects) is the fruit of imagination. Imagination is born from the fact of death, as a reflection of mortality – we exist ergo we are mortal ergo we imagine ergo we exist. The ever-unfolding vista of Mythos takes shapes of images, symbols, rituals, customs, social relations, poetry, games and legends. Imagination fills the space (or rather time) between itself and the realm of non-existence with things we see, hear, feel, create, destroy, hope for, dream about, etc. I like this idea of the interplay between Mythos and Logos and the way Logos has to change according to shifts in Mythos. 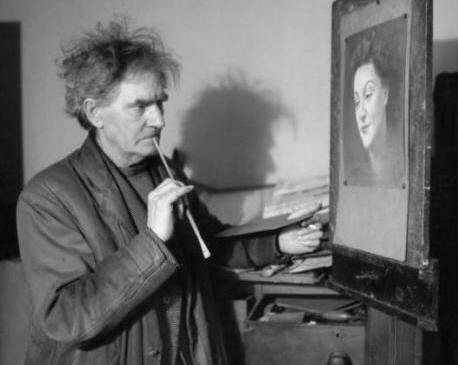 DFC talks about his sigil construction technique and how it differs from that developed by Austin Osman Spare. 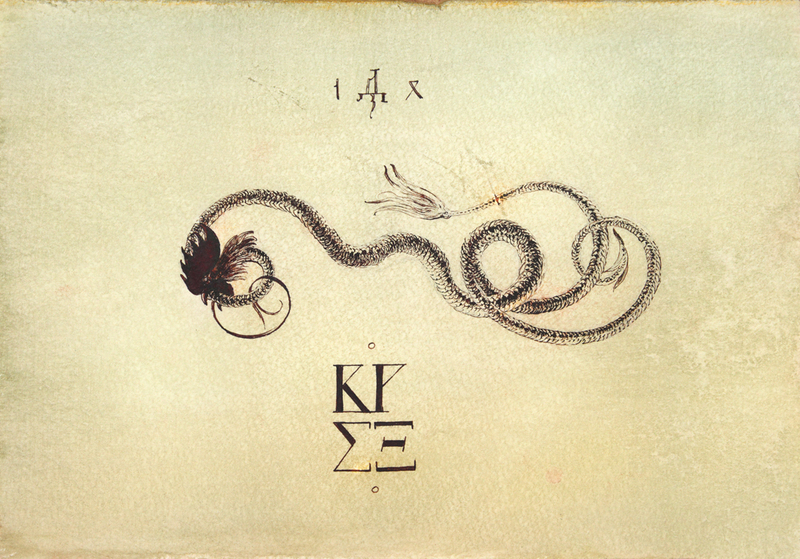 His experience in use of eastern calligraphic techniques (especially farsi) have influenced his sigil creation and given it a very fluid form. “At the heart of Poïesis (hi-lighting my own) is metaphor, a vessel that can project idea ideas from one conceptual domain onto another; it allows us to manipulate imagination. I believe metaphorical projection and transcendence is the main function of religious rituals, and I choose to base my practice on the assumption that ritual is, in fact, a metaphor. Ansell. R (Ed. ), 2013, Abraxas Issue 3, Spring 2013, Fulgur Esoterica, London, England. 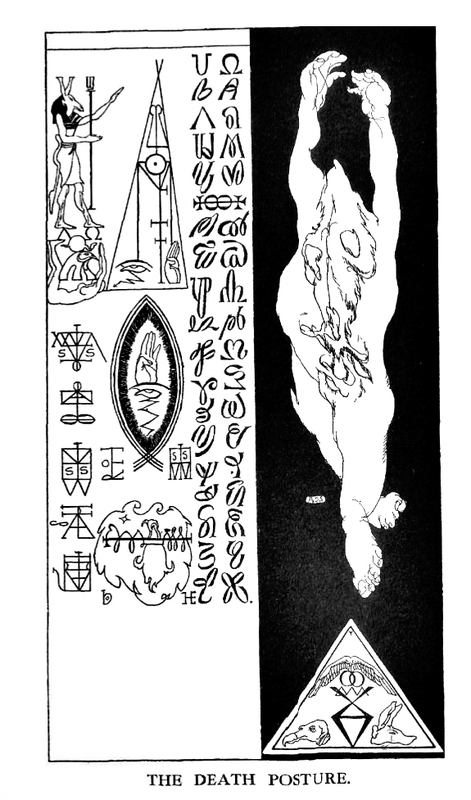 AOS is very interesting to me because of his depictions of the esoteric and the way he chose to express those ideas through diagrams, sigils and symbols that both reveal and hide the message. He started out his artistic career at The Royal College of Art in London where his interest in strong line work (influences of Aubrey Beardsley and EJ Sullivan) apparently made him unpopular with the contemporary art scene. 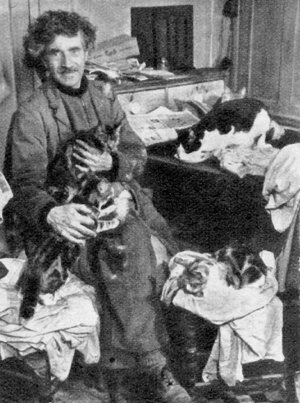 Throughout his life he worked in a variety of mediums: paintings, drawings, pastels and etchings. After developing his interest in Western Esotericism these subjects informed all his work from this point on and he developed his own powerful and unusual system of mysticism centred around his ideas of ‘Zos’ – the human consciousness and ‘Kia’ – the universal consciousness. The Death Posture, 1913 (A self portrait. Interestingly the white horned statue of a woman is an ancient carving of Ishtar/Astarte that currently resides in the Louvre). Many of his artworks from this time were ‘automatic drawings’ that were created during magical trance states and that he believed were created when his conscious mind was held at bay. The elements in his artwork which are of particular interest to me and my research are his use of sigils in his work. The sigils are created from words, letters, images and distilled into almost unintelligible symbolic diagrams. The messages within the sigils and their intent should bypass the conscious mind and find action in the unconscious mind. 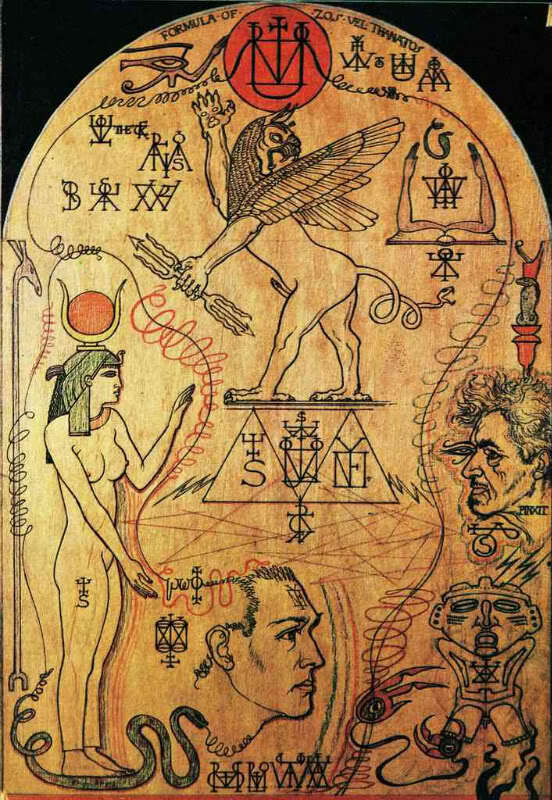 The desire and conscious understanding of both the practitioner (artist/occultist) and the viewer should be dispelled by the indecipherability of the sigil. It is preferable that neither viewer understands the meaning and that it is filtered through the unconscious mind and the meaning extracted without thought or desire. The following quote expresses the feelings of a viewer who realised that Spare was creating diagrammatical infographics of his ideas as a method of communication, but that he did not have the necessary knowledge to understand them. Whether this is important or not is debatable as it was perhaps not the intention of AOS to communicate these ideas in a didactic form to a viewer who was uninitiated in the symbology of his mysticism. 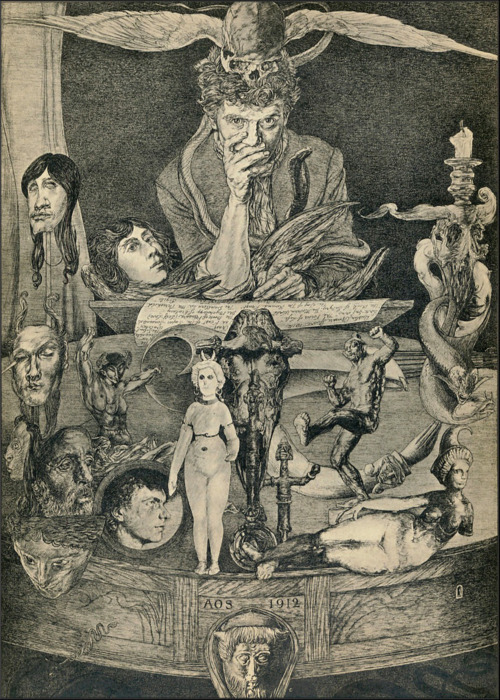 In a 1914 review of The Book of Pleasure, the critic (anonymous) seems resigned to bewilderment, “It is impossible for me to regard Mr. Spare’s drawings otherwise than as diagrams of ideas which I have quite failed to unravel; I can only regret that a good draughtsman limits the scope of his appeal”.